The McAfee Complete Data Protection — Advanced suite protects your data from risk of loss, theft, and exposure using a combination of powerful enterprise-grade endpoint encryption, access control, and user-behavior monitoring. The suite helps you establish and enforce a data protection policy and centralizes data security management using the McAfee ePolicy Orchestrator (ePO) management console. This advanced suite features data loss prevention, device control, and optionally, management of native encryption for encryption native to Mac and Microsoft Windows PCs*. Additionally, McAfee ePO Deep Command provides remote security management to access Intel vPro-based PCs to implement patches, reset passwords, and to remediate broken endpoints. Protect your data from loss or theft with a blazing fast endpoint encryption solution that is FIPS 140-2 and Common Criteria EAL2+ certified, and accelerated by the Intel Advanced Encryption Standard New Instructions (Intel AES-NI). Deploy and provision with confidence with the Endpoint Encryption Go utility to ensure your endpoints have passed pre-encryption inspections and ongoing health monitoring. Gain control over your data by monitoring and regulating how employees use and transfer data via common channels, such as email, IM, printing, and USB drives—both in and away from the office. Stop data loss initiated by sophis­ticated malware that hijacks sensitive and personal information. Communicate with and take control of your endpoints at the hardware level whether they are powered off, disabled, or encrypted to halt desk­side visits and endless help desk calls due to security incidents, outbreaks, or forgotten encryption passwords. Conduct resource­intensive tasks during off hours to limit impact to users. Lower IT costs by reducing frequent desk­side visits and lengthy service calls. Quickly discover and provision Intel AMT by easily identifying Intel vPro­equipped PCs and then enabling Intel AMT for streamlined activation. 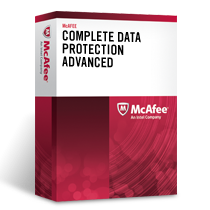 McAfee Complete Data Protection—Advanced Suites. Monitor and regulate how your employees access, use, and transfer data via common channels, such as email, IM, printing, and USB drives — both in and away from the office. Preventing data loss at the endpoint begins with improving visibility and control over your data, even when it is disguised. McAfee Complete Data Protection—Advanced enables you to implement and enforce company-wide security policies that regulate and restrict how your employees use and transfer sensitive data via common channels, such as email, IM, printing, and USB drives. It does not matter if they are in the office, at home, or on the move—you stay in control. Management of native encryption v1.0 allows customers to manage the native encryption functionality offered by Apple FileVault on OS X Mountain Lion and OS X Mavericks directly from McAfee® ePolicy Orchestrator® (McAfee ePO™) software. It thus provides zero-day compatibility with OS X patches, upgrades, firmware updates from Apple, as well as zero-day support for new hardware from Apple. Management of native encryption v1.0 allows administrators to manually import FileVault Recovery Keys where users have already manually enabled FileVault. Use the centralized McAfee ePO software console to implement and enforce mandatory, companywide security policies that control how data is encrypted, monitored, and protected from loss. Centrally define, deploy, manage, and update security policies that encrypt, filter, monitor, and block unauthorized access to sensitive data. Monitor and regulate how employees transfer data to removable media—even when they are not connected to the corporate network. Control how users send, access, and print sensitive data at the endpoint—physical or virtual, through applications, and onto storage devices. Stop confidential data loss initiated by Trojans, worms, and file-sharing applications that hijack employee credentials. Protect all data, formats, and derivatives, even when data is modified, copied, pasted, compressed, or encrypted. Access encrypted data anywhere without the need for any additional software. Manage FileVault on any Mac hardware that can run OS X Mountain Lion or OS X Mavericks directly from McAfee ePO software. 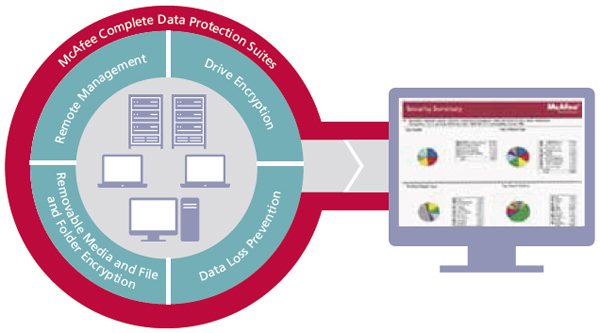 Download the McAfee Complete Data Protection Advanced Datasheet (PDF).